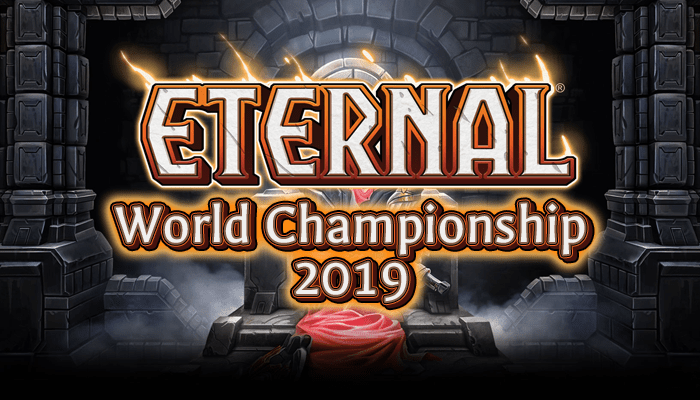 The Midseason Major is the highest stakes Eternal tournament outside of the World Championships. Sixteen of the best players from the first three seasons of play battle it out for prizes, glory, and an invitation to the World Championships! The Midseason Major will be held over two days, beginning at 12pm EDT on Saturday, April 15th and continuing at 12pm EDT on Sunday, April 16th. The stream for both days will be live on the aReNGeeEternal twitch stream and should begin an hour before the tournament starts. The Midseason Major is a sixteen person tournament, but it uses a totally different format from any previous Eternal tournament. Day One begins with pool play – players are broken up into pools of four players. However, rather than a standard round robin, players compete in a mini double elimination tournament to progress to Day Two. First, players pair off and play. The losers of the first match play each other, and the loser is out of the tournament. Then the winners of the first match play each other, and the winner of that match makes it to Day Two. The loser faces the winner of the 0-1 match – winner moves on, loser goes home! We’ll be bringing you all the elimination/qualification matches from each pool live on stream. Day Two is a double elimination tournament between the eight players who moved on. We’ll only be broadcasting one match in the first round, but we’ll be broadcasting every subsequent match of the Top 8 so you won’t miss a thing! The top twelve (12) players on the Worldwide Rankings. The winner (1) of the MSM LCQ. The Midseason Major is a collection of the best and most successful Eternal tournament players, and the invitation criteria reflect that. Four players are invited directly for winning major tournaments, while the other twelve are invited based on their Series point totals, which indicates success at previous tournaments. Series Points are not easy to acquire – you need to Top 4 a weekly tournament or Top 12 an Invitational just to earn a single point! Players are seeded into groups based on how they qualified, as indicated by the image above. In the case of a tie in series points, the player with the higher finish at the Season Three Invitational will get the higher seed. If players remain tied, the higher seed goes to the player with the higher Invitational Point total in Season Three. If players remains tied, the higher seed will be determined randomly. Players are seeded into Top 8 Based on their pod and exit. Players who win both their matches and advance 2-0 are considered the 1st seed of that group. Players who advance from an elimination match (with a 2-1 record) are considered the second seed of that group. The Worldwide Rankings will lock for MSM invitations after the Season Three Invitational. At that time, we will invite the twelve highest ranked players who are not Invitational winners. In the case of a tie in points, all tied players will be invited, and a tiebreaker procedure will be determined if necessary. Players will be formally invited on Monday, April 3rd, and have until 11:59pm EDT on Wednesday, April 5th, to confirm their attendance. At this time, all players who have declined their invitation or failed to confirm their attendance will be considered not to be attending, and replacements will be invited beginning with the highest ranked non-qualified player.Replacement Players will be contacted on Thursday, April 6th, and have Twenty-Four (24) hours to confirm their attendance. Decklists for all Invitational Players are due at Noon EDT on Friday, April 14th. No Exceptions. The Last Chance Qualifier will be held on Saturday, April 8th, beginning at 12pm EDT. The rules for the tournament are exactly the same as a regular ETS Weekly (Swiss Tournament, cut to Top 8) with two exceptions. Firstly, this Last Chance Qualifier does NOT award points of any kind. Secondly, players who have already been invited to the Midseason Major are not eligible to play in the Last Chance Qualifier, and will be disqualified from the LCQ if they register. Only the winner will move on to the Midseason Major, and we’ll be streaming every round along the way. The Last Chance Qualifier will be streamed on the RNG Eternal Twitch channel. Registration for the Last Chance Qualifier opens on April 3rd. Many thanks to Jellomoose of EternalNexus and our own RNG MillerTool, who are sponsoring the prize pool of this tournament! First Place: The title of Midseason Major Champion (which auto-qualifies this player for the World Championships), the Champion Discord badge, a cash prize of $200, and 16 Series Points. Second Place: A cash prize of $100 and 12 Series Points. Third Place: A cash prize of $75 and 10 Series Points. Fourth Place: A cash prize of $50 and 8 Series Points. Fifth and Sixth Place: A cash prize of $30 and 6 Series Points. Seventh and Eighth Place: A cash prize of $25 and 4 Series Points.